Australian’s are becoming savvier with how they spend their money and turning to domestic travel as the solution for an opportunity to still get away. With the Australian dollar weakening, many Australians are altering their travel habits, knowing there’s currently great value for travelling in our own backyard. A survey by industry group Tourism & Transport Forum found 5% of travelers had already switched from an international to a domestic destination because of the currency’s fall, and 15% expected to travel more domestically in the future. Tourism Research Australia figures show domestic overnight tourism has increased 7% with spend increasing by 10% to $70.3B and total nights away up 6% ($368.2M). And it’s not just Australians making the most of the weaker dollar – International tourism into Australia is expected to rise further in 2019 after a 6% increase last year. 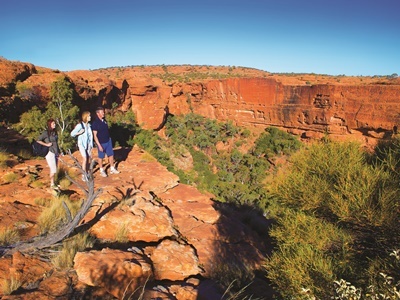 The Northern Territory is the most popular destination across the AAT Kings portfolio if day tours, short breaks and guided holidays. The Inspiring Journeys 10-day Ultimate Territory Adventure in Style will see travelers explore Kakadu’s ancient gorges, spectacular wetlands and unique wildlife, and meet the descendants of Aboriginal people who have lived here for 65,000 years. Then on to the magical Red Centre, experiencing iconic Uluru, the mystical domes of Kata Tjuta, and windswept Walpa Gorge. Australia’s stunning West Coast has arguably some of the most beautiful beaches in Australia, such as the crystal clear water of Coral Bay as well as an array of pristine marine life such as the bottle nose dolphins at Monkey Mia. The wild west is also home to the breathtaking Karijini National Park where Trafalgar guests will stay in environmentally friendly retreat in on its 13 Day Wonders of the Pilbara and West Coast, offering guests unique and immersive experiences in each of these magnificent locations and showcasing the highlights of WA. 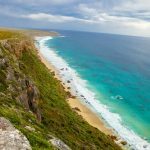 Tasmania offers a unique blend of old and new world experiences that has seen its domestic visitation rise by 11%, the strongest results country wide. Renowned for its pristine wilderness and gourmet food and wine, you’re in for a treat when you journey to the Apple Isle on the 12-day AAT Kings Perfect Tasmania holiday. Visit the famous Salamanca Markets where you can browse Tasmanian arts, crafts and fresh produce, take a hike along Dove Lake and get the best views of the beautiful Cradle Mountain National Park. From Hobart to Cradle Mountain, Launceston, Freycinet National Park and Port Arthur – you’ll see the best Tasmania has to offer. Explore the best of Australia and New Zealand with AAT Kings Great Australian sale. Guests can save up to $1300 per couple during the sale between 7 Jan – 15 March 2019 inclusive, for selected itineraries and selected departures before 31 December 2019. There’s no better time to book, with 10% off Trafalgar’s Australia, New Zealand, Europe & Britain trips until 31st January, 2019.